^ 加拿大報告：中國軍方摘取法轮功囚犯器官. (台灣)中央通訊社. 法新社. 2007-01-31 [2015-03-14]. （原始内容存档于2015-09-24）. ^ 4.0 4.1 香港蘋果日報：薄谷夫婦涉活摘法轮功器官撈巨資. （大紀元引述）香港蘋果日報. 2012-10-04 [2015-03-14]. （原始内容存档于2015-09-24）. ^ Chinese massacres:China Implicated in Organ Harvesting(影音新聞--中國的屠殺：中國涉及活摘法轮功器官). Toronto Sun 多倫多太陽報(加拿大). 2012-05-03 [2015-03-14]. （原始内容存档于2015-03-15）. ^ 黎珍珍. 法轮功學員成活體器官供應庫 王文怡舉實證 批中共暴政. (台灣)中國時報 (台北). 2006-10-13 [2012-11-08]. （原始内容存档于2013-09-27）. ^ 2011 Country Reports on Human Rights Practices（2011年度美國國務院各國人權報告） (PDF). 美國國務院: 頁6. 2012-05-24 [2015-03-14]. （原始内容存档 (PDF)于2015-09-24）. ^ 14.0 14.1 14.2 14.3 14.4 14.5 Manfred Nowak(Special Rapporteur on torture and other cruel, inhuman or degrading treatment or punishment). Summary of cases transmitted to Governments and replies received (Page36~) (PDF). 聯合國人權委員會 United Nations Human Rights Council: 36~. 2008-02-19. （原始内容 (PDF)存档于2013-10-29）. ^ 16.0 16.1 Peter Westmore. HUMAN RIGHTS: Senate urges government action on China organ-harvesting. 國家新聞週刊（英语：News_Weekly）. 2013-04-23 [2015-11-29]. （原始内容存档于2015-12-08）. ^ JESSICA FIRGER. IS CHINA STILL HARVESTING ORGANS FROM ITS POLITICAL PRISONERS?. Newsweek 美國新聞週刊. 2016-06-15 [2016-08-20]. （原始内容存档于2016-08-20）. ^ 20.0 20.1 Richard Reeb. Red China plays defense on its organ harvesting. Desert Dispatch(美國加州). 2016-08-30. （原始内容存档于2016-09-01）. ^ CTV.ca News Staff (6 July 2006) "Chinese embassy denies organ harvesting report" Archive.is的存檔，存档日期2006-07-11, CTV.ca. Retrieved 8 July 2006. ^ Canadian Press (7 July 2006) "Report claims China kills prisoners to harvest organs for transplant" 互联网档案馆的存檔，存档日期2007-03-12., canada.com. Retrieved 8 July 2006. ^ 24.0 24.1 亞瑟·卡普蘭Arthur Caplan. 【美國費城醫學院演講視頻】卡普蘭：中國的器官移植與「按需殺人」（演講原題：使用囚犯遺體做器官來源的道德倫理問題The Ethics of Using Prisoners as Sources of Cadaver Organs）（中文字幕）. 2012-03-23 [2015-03-14]. （原始内容存档于2015-12-28）. ^ 25.0 25.1 Arthur Caplan. The Ethics of Using Prisoners as Sources of Cadaver Organs(醫學論文：使用囚犯遺體做器官來源的道德倫理問題-談及中國「按需殺人」現像) (PDF). The American Journal of Bioethics(美國生物倫理學雜誌). October 2011, 11(10): 1–5 [2015-03-14]. doi:10.1080/15265161.2011.607397. （原始内容存档 (PDF)于2016-03-04）. ^ 26.0 26.1 WE PETITION THE OBAMA ADMINISTRATION TO: Investigate and publicly condemn organ harvesting from Falun Gong believers in China. 美國白宮官網_We People請願網站. 2012-12-02. （原始内容存档于2012-12-14）. ^ 胡平. 罪恶黑幕揭开一角（下） （胡平）（談鳳凰週刊《中国人体器官买卖的黑幕》）. 自由亞洲電台RFA. 2015-04-27 [2015-11-13]. （原始内容存档于2015-11-09）. ^ 31.0 31.1 胡平. 法轮功活摘指控获间接证实，黄洁夫讲话“你懂的”. 北京之春. 2015-03-26 [2015-11-13]. （原始内容存档于2015-11-17）. ^ 狄雨霏. 中国举办国际器官移植大会引发医学界争议. 紐約時報中文网. 2016-08-18. （原始内容存档于2016-08-19）. ^ DIDI KIRSTEN TATLOW. Chinese Claim That World Accepts Its Organ Transplant System Is Rebutted. 紐約時報. 2016-08-19. （原始内容存档于2016-08-19）. ^ NOMAAN MERCHANT. Doctors hail China's pledge to stop harvesting inmate organs. 美聯社（AP）. 2016-10-17. （原始内容存档于2016-10-19）. ^ 42.0 42.1 顧恆湛. 加國獨立調查 十八類證據證實中國活摘器官. (台灣)中央通訊社 (台北). 2006-10-13 [2012-11-08]. （原始内容存档于2013-10-29）. ^ 王昶閔. 中國強摘器官 台搶購形同幫兇. （台灣）自由時報. 2007-10-30. （原始内容存档于2013-10-29）. ^ China faces suspicions about organ harvesting. The Christian Science Monitor. 3 August 2006 [2015-03-14]. （原始内容存档于2015-04-02）. ^ BLOODY HARVEST. organharvestinvestigation.net. [13 November 2010]. （原始内容存档于2015-02-11）. ^ 大卫·乔高 ＆大卫·麦塔斯. 《血腥的活摘器官》. 博大出版社. 2011年5月: 頁197–198. ISBN 978-986-85209-5-0. ^ 加律師稱中國買賣法轮功成員器官. BBC 中文網. 2006-07-07 [2015-03-14]. （原始内容存档于2015-04-02）. ^ 大卫·乔高 ＆大卫·麦塔斯. 《血腥的活摘器官》. 博大出版社. 2011年5月: (第十章：印證)頁129~. ISBN 978-986-85209-5-0. ^ 59.0 59.1 59.2 莉雅. 新書：器官摘取成為中共解決政治犯秘密途徑. 美國之音VOA. 2014-08-17 [2015-03-14]. （原始内容存档于2015-04-02） （中文）. ^ 莉雅. 时事看台：中国器官摘取的争议与反应. 美國之音VOA. 2014-08-18 [2015-03-14]. （原始内容存档于2015-04-02）. ^ （節目The Leonard Lopate Show）. China's Secret Organ Transplant Business（中國的祕密器官移植產業）. WNYC（英语：WNYC）紐約公共電台（英语：WNYC）. 2014-08-13 [2015-03-14]. （原始内容存档于2015-04-02）. ^ Daniel Wiser. Organ Harvesting New Form of Execution in China--- New book reveals practice of targeting political prisoners. 華盛頓自由燈塔. 2014-08-13 [2015-03-14]. （原始内容存档于2015-03-19）. ^ AL Caplan（Arthur Caplan）. Time for a boycott of Chinese science and medicine pertaining to organ transplantation(醫學論文：抵制關於中國器官移植的醫學研究刻不容緩) (PDF). The Lancet 英國-柳葉刀醫學雜誌. Oct 2011, VO.378: 1218 [2015-03-14]. （原始内容存档 (PDF)于2012-01-13）. ^ Michael Cook. Interview: Art Caplan on boycotting Chinese organ transplants. BioEdge. 2011-10-11 [2015-03-14]. （原始内容存档于2015-02-04）. 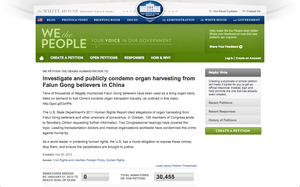 ^ we petition the obama administration to: Investigate and publicly condemn organ harvesting from Falun Gong believers in China//Response to We the People Petition on Organ Harvesting in China. WhiteHouse. （原始内容存档于2015-07-25）. ^ 天溢（德國柏林）. 法轮功学员是中共强制摘取器官的受害者. 自由亞洲電台RFA. 2012-07-20 [2015-03-14]. （原始内容存档于2015-04-02）. ^ CK. 世界器官移植大会在旧金山举行，法轮功学员揭示中共活摘人体器官罪行. 自由亞洲電台RFA. 2014-07-30 [2015-03-14]. （原始内容存档于2014-10-09）. ^ 王元甫. 中國強摘器官 恐傷台灣醫界. (臺灣)自由時報. 2014-12-25 [2015-12-17]. （原始内容存档于2015-12-22）. ^ 端木珊、夏言. 醫生反對強摘器官組織”獲諾貝爾和平獎提名. 看中國. 2016-02-12 [2016-03-18]. （原始内容存档于2016-03-25）. ^ 中国否认有关死囚器官指称. BBC中文網. 2001年6月8日 [2015-03-14]. （原始内容存档于2015-02-05）. ^ 大衛·麦塔斯&大衛·乔高. 關於指控中共摘取法轮功学员器官的調查报告2007年修訂版（英文本） (PDF): 頁40–41的注釋41–45). 2007-01-31 [2015-03-14]. （原始内容存档 (PDF)于2014-02-15）. ^ 大衛·麦塔斯&大衛·乔高. 關於指控中共摘取法轮功学员器官的調查报告2007年修訂版（中譯本） (PDF): 頁7–11(引用中國醫院、器官移植中心網頁內容–含網頁庫存網址). 2007-01-31 [2015-03-14]. （原始内容存档 (PDF)于2015-02-21）. ^ 大衛·麦塔斯&大衛·乔高. 關於指控中共摘取法轮功学员器官的調查报告2007年修訂版（中譯本） (PDF): 8–11). 2007-01-31 [2015-03-14]. （原始内容存档 (PDF)于2015-02-21）. ^ 沈正彥. 高官招認 私賣死囚器官（引用英國《泰晤士報》）. 蘋果日報(台灣). 2005年12月4日 [2015-03-14]. （原始内容存档于2015-04-02）. ^ Llew-Ann Phang. China: 41,500 transplants unaccounted for（無法解釋的4萬1千5百宗器官移植）. The Sun Daily（馬來西亞-太陽報-英文）. 2006-12-27 [2015-03-14]. （原始内容存档于2014-12-24）. ^ 大卫·乔高 ＆大卫·麦塔斯. 《血腥的活摘器官》. 博大出版社. 2011年5月: 頁98. ISBN 978-986-85209-5-0. ^ Wang Hao（王浩,耶魯大學研究助理）. 《China’s Organ Transplant Industry and Falun Gong Organ Harvesting: An Economic Analysis》（對中國器官移植產業和法轮功活體器官摘取的經濟分析） (PDF). 耶魯大學經濟學教授 T.N.Srinivasan, YALE UNIVERSITY: 全文共57頁. 2007年4月 [2012-11-08]. （原始内容存档 (PDF)于2013-06-25）. ^ 79.0 79.1 大衛·麦塔斯&大衛·乔高. 《血腥的活摘器官》（第8章：數字）. 博大出版社. 2011年5月: 頁96–112. ISBN 978-986-85209-5-0. ^ 2007 Country Reports on Human Rights Practices（2007年度美國國務院各國人權報告）. 美國國務院: China 中國部分. 2008-03-11 [2015-03-14]. （原始内容存档于2015-04-02）. ^ Tun-jen Cheng; Deborah A. Brown. Religious Organizations and Democratization Case Studies from Contemporary Asia. M.E. Sharpe. 2006: 37. ISBN 978-0-7656-1508-4. Note 31. 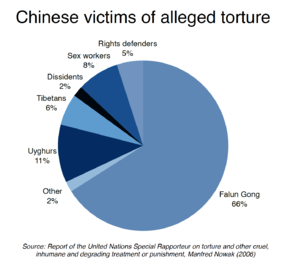 According to the Economist, 28 percent of the inmates in China's labor camps are followers of the Falun Gong spirital movement. ^ 83.0 83.1 大衛·麦塔斯&大衛·乔高. 關於指控中共摘取法轮功学员器官的調查报告2007年修訂版（中譯本） (PDF): 頁20,25(系统性验血及器官检查),页28(录音译文广西自治区南宁市民族医院2006年医生承认赴监狱挑选，亦存在抽血检验). 2007-01-31 [2015-03-14]. （原始内容存档 (PDF)于2015-02-21）. ^ 大卫·乔高 ＆大卫·麦塔斯. 《血腥的活摘器官》（第8章：數字）. 博大出版社. 2011年5月: 頁106–107. ISBN 978-986-85209-5-0. ^ 大卫·乔高 ＆大卫·麦塔斯. 《血腥的活摘器官》. 博大出版社. 2011年5月: （第6章：醫院）頁72–75. ISBN 978-986-85209-5-0. ^ 大卫·乔高 ＆大卫·麦塔斯. 《血腥的活摘器官》. 博大出版社. 2011年5月: （第8章：數字）頁96–99. ISBN 978-986-85209-5-0. ^ "Organspenden" in China Zu gesund, um zu leben?死刑犯器官不夠中國移植用. Frankfurter Allgemeine Zeitung德國法蘭克福匯報（德國第二大日報）. 2007-04-02 [2012-11-06]. （原始内容存档于2014-02-21）. ^ 七十餘份聯合國人權報告揭露中共十年迫害. 明慧網. 2010年10月6日 [2015-03-14]. （原始内容存档于2015-04-02）. ^ 專訪聯合國酷刑專員曼弗瑞德·諾瓦克教授-仍在中國進行的活體器官摘除. 大紀元時報. 2009-08-10 [2016-08-21]. （原始内容存档于2016-08-29）. ^ 董韻. 國際組織提案聯合國：緊急調查活摘法轮功器官. 大紀元時報 (日內瓦). 2012-09-19 [2015-03-14]. （原始内容存档于2015-09-24）. ^ 國際非政府組織 NGO 「世界婦女組織 Worldwide Organization for Women」組織詳細資料. 法治世界網（國際非政府組織 NGO資料庫）. [2015-03-14]. （原始内容存档于2014-09-03）. ^ 董韻. 世界婦女組織在聯合國人權大會會場播活摘器官真相. 大紀元時報 (日內瓦). 2012-09-23 [2015-03-14]. （原始内容存档于2015-04-02）. ^ The European Parliament’s resolution on unethical organ harvesting in China is succeeded by a chain of international reactions. dafoh.org. [2015-03-14]. （原始内容存档于2014-10-18）. ^ 聯合國官網Human Rights Council. Council reviews reports on the use of drones in the fight against terrorism, and on freedom of religion. ohchr.org. 12 March 2014 [2015-03-14]. （原始内容存档于2015-03-18）. ^ 聯大首次政府代表 提中共活摘器官. 新唐人電視台. 2014-03-19 [2015-03-14]. （原始内容存档于2015-04-02）. ^ 林瀾、秦雪採訪. 中共退休軍官：溫家寶曾斥周永康「活摘」. 新唐人電視台. 2015-04-21 [2015-04-25]. （原始内容存档于2015-04-22）. ^ 100.0 100.1 关于中共军队、武警医院系统 涉嫌参与活体摘取法轮功学员器官的调查报告. 追查國際. 2012-05-29 [2015-03-16]. （原始内容存档于2015-03-18）. ^ 軍隊醫院刑場搶死囚器官. 香港蘋果日報. 2015-03-07 [2015-03-16]. （原始内容存档于2015-03-09）. ^ NOMAAN MERCHANT. Doctors hail China's pledge to stop harvesting inmate organs. AP 美聯社. 2016-10-17 [2016-10-19]. （原始内容存档于2016-10-19）. ^ （2006第一次聲明）Response to the so called "China's organ harvesting report" (新闻稿). 中華人民共和國駐加拿大大使館. 2006-07-06 [2015-03-14]. （原始内容存档于2014-08-13）. ^ （2006第二次聲明）Chinese Embassy's Statement on the Issue of Falun Gong (新闻稿). 中華人民共和國駐加拿大大使館. 2006-07-06 [2015-03-14]. （原始内容存档于2015-03-15）. ^ （2006第二次聲明）驻加拿大使馆就“法轮功”问题发表的声明 (新闻稿). 中華人民共和國駐加拿大大使館. 2006-07-26 [2015-03-14]. （原始内容存档于2014-08-13）. ^ Response of David Kilgour and David Matas to the Chinese government statement. (PDF) (新闻稿). David Kilgour and David Matas. 2006-07-07. ^ 楊晨, 魏之, 常晓. 美国会法案指中国可能摘取法轮功人士器官. 美國之音. 2016-04-22 [2016-05-03]. （原始内容存档于2016-05-08）. ^ 美国会众议院通过决议 敦促中国停止强摘良心犯器官. 自由亞洲電台. 2016-03-17 [2016-03-17]. （原始内容存档于2016-03-25）. ^ Urging China’s President Xi To Stop State-Sponsored Human Rights Abuses（聽證會紀錄）. 美國國會CECC委員會官網. 2015-09-18 [2018-11-01]. （原始内容存档于2018-09-21）. ^ 刘新. 美国际宗教自由委员会敦促停止迫害法輪功. 德國之聲DW.DE. 2013-07-29 [2018-11-01]. （原始内容存档于2015-03-15）. ^ CONGRESSIONAL-EXECUTIVE COMMISSION ON CHINA ANNUAL REPORT 2012（美國國務院2012年度國別人權報告）. 美國國務院: 6,Prison and Detention Center Conditions. 2013-04-19 [2015-03-14]. （原始内容存档于2016-12-25）. ^ 記者黎欣宇. 中共稱停用死囚器官「為更隱蔽移植器官」. 大紀元時報. [2013-05-29]. （原始内容存档于2014-07-14）. ^ Country Reports on Human Rights Practices for 2013【China (includes Tibet, Hong Kong, and Macau】美國國務院2013年度國別人權報告 (PDF). 美國國務院. [2014-02-07]. （原始内容存档 (PDF)于2014-02-28）. ^ 美国国会听证调查中國强摘器官现象. VOA美國之音. [2012-11-05]. （原始内容存档于2012-11-03）. ^ 記者方方、楊晨、 常曉. VOA：美國國會聽證法轮功在華受迫害現狀. VOA美國之音. 2012-12-19 [2013-03-29]. （原始内容存档于2014-08-08）. ^ 董韵. 106位美國會議員聯名要求國務院公布中共活摘器官罪行. 新唐人電視台. 2012年10月5日 [2018-11-01]. （原始内容存档于2016-03-04）. ^ 宋升樺. 白宮回應活摘器官 頂級專家促制裁中共. 新唐人電視. 2015-03-27 [2015-08-28]. （原始内容存档于2015-03-27）. ^ 美國國務院談中國法輪功問題. 美國國務院國際信息局. 2006-04-16 [2016-08-18]. （原始内容存档于2016-03-04）. ^ Jennifer Zhang. Exposing China's organ harvesting. StarTribune. 2015-05-02. （原始内容使用|archiveurl=需要含有|url= (帮助)存档于2016-04-12）. ^ 加拿大国会打击强摘器官法案通过第二轮辩论. PARLIAMENT of CANADA（House of Commons Canada）. 2018-12-10 [2018-12-24]. ^ 記者 林文萱. 歐議會舉辦中共信仰迫害聽證會 直指活摘器官. 大紀元時報 (布魯塞爾). 2013-01-30 [2013-03-29]. （原始内容存档于2013-02-03）. ^ 英國保守黨人權報告呼籲重新審視對華政策. BBC. 2016-06-27 [2016-10-19]. （原始内容存档于2016-10-19）. ^ Benedict Rogers(英國保守黨人權委員會副主席). Organ Harvesting in China： Two new reports shed light on a gruesome practice.. The DIPLOMAT (外交家雜誌). 2016-07-29. （原始内容存档于2016-07-30）. ^ 揭露大陸活摘器官醜聞電影　英國會將播映. TVBS(臺灣). 2016-09-02 [2016-10-19]. （原始内容存档于2016-10-19）. ^ Forced organ removal in China. Parliment.uk英國國會官網. [2016-10-05]. （原始内容存档于2016-10-19）. ^ [researchbriefings.files.parliament.uk/documents/CDP-2016-0174/CDP-2016-0174.pdf (Debate Pack)Forced organ removal in China（會議紀錄）] 请检查|url=值 (帮助) (PDF). Parliment.uk 英國國會官網. 2016 （英语）. ^ 吳釗燮:政府譴責活摘器官 關切中國迫害人權. 中央通訊社. 2006-10-13 [2015-03-14]. （原始内容存档于2014-08-08）. ^ 劉鳳琴. 稱中共活摘器官 調查小組籲台抵制. (台灣)中國時報 17版兩岸新聞. 2006-10-13 [2012-11-08]. （原始内容存档于2011-06-26）. ^ 王昶閔. 中國移植醫師 全面禁止來台. (台灣)自由時報. 2007-10-30. （原始内容存档于2013-10-30）. ^ 王昶閔. 中國強摘器官 台搶購形同幫兇. (台灣)自由時報. 2007-10-30 [2012-11-08]. （原始内容存档于2013-10-29）. ^ 立法院查詢系統記錄（立法院第8屆第2會期第12次會議）. 立法院國會圖書館. 2012-11 [2013-03-27]. （原始内容存档于2014-05-31）. ^ 記者林朝億. 立院通過關懷4033名中國良心犯. 《新頭殼》newtalk (台北). 2012-12-11 [2012-12-12]. （原始内容存档于2012-12-14）. ^ 155.0 155.1 Groot, Gerry; Stafford, Glen. China and South Australia. (编) John Spoehr; Purnendra Jain. The Engaging State: South Australia's Engagement with the Asia-Pacific Region. Wakefield Press. 2012: 103. ISBN 9781743051573. In related vein, another paper with wide distribution but published elsewhere is Epoch Times (Dajiyuan shibao), the qigong meditation religious group Falun gong mouth-piece, which runs a strong anti-communist line. ^ 156.0 156.1 Thornton, Patricia M. Manufacturing Dissent in Transnational China. (编) Kevin J. O'Brien. Popular Protest in China. Harvard Contemporary China 15. Harvard University Press. 2008: 199–200. ISBN 9780674041585. ^ 157.0 157.1 Tong, Clement. Western Apocalyptic Narratives in the International Arena. (编) Jean-Guy A. Goulet; Liam D. Murphy; Anastasia Panagakos. Religious Diversity Today: Experiencing Religion in the Contemporary World 3. ABC-CLIO. 2015: 71. ISBN 9781440833328. ^ 160.0 160.1 Susan V. Lawrence. Falun Gong Fields Media Weapons. THE WALL STREET JOURNAL. [2018-01-04]. ^ 161.0 161.1 David Ownby. 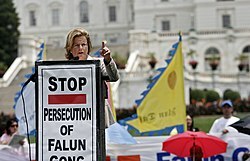 Falun-Gong. ^ 澳外長：中共對法轮功違背國際人權標準. 大紀元時報. 2008-07-09 [2015-03-14]. （原始内容存档于2015-02-04） （中文）. ^ 164.0 164.1 Russia bans human rights lawyer Matas - Winnipeg Free Press. [2015-03-14]. （原始内容存档于2015-04-02）.